Another decade hopping entry, this one from 1952 set in 1927 when silent films were being replaced by those state-of-the-art “talkies.” Someday they’ll remake this film only it’ll be about 3D. 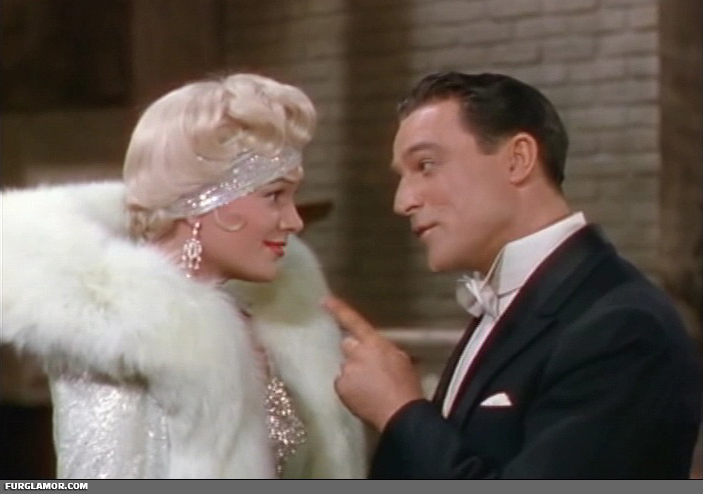 Silent film couple Don Lockwood (Gene Kelly) and Lina Lamont are America’s current set of sweethearts on screen, but have a slightly more complex relationship off screen. Lina’s voice isn’t quite up to the difficult task of “being heard” and jeopardizes their first major talkie. Don has a chance meeting with Kathy Selden (Debby Reynolds) who, in a completely unexpected twist, is a enormously talented and endearing woman with whom he falls deeply in love. Despite Lina’s best efforts, they end up living happily ever after. 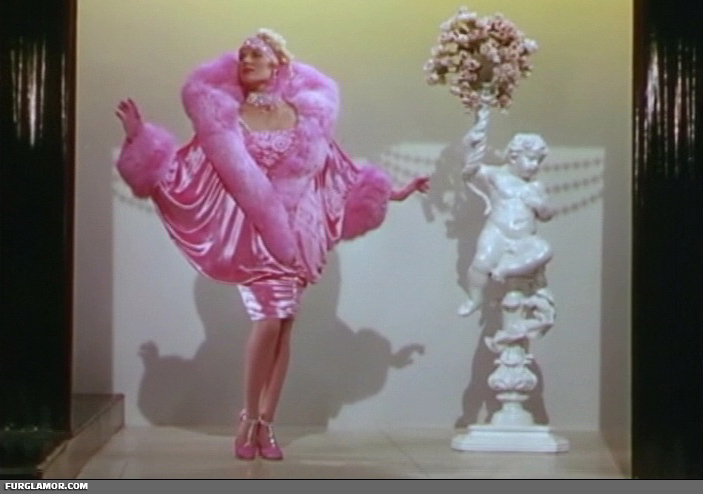 Jean Hagen is Lina Lamont in the film, and, as a successful silent film star, wears (almost) all the furs. The roll earned her a Best Supporting Actress nod. 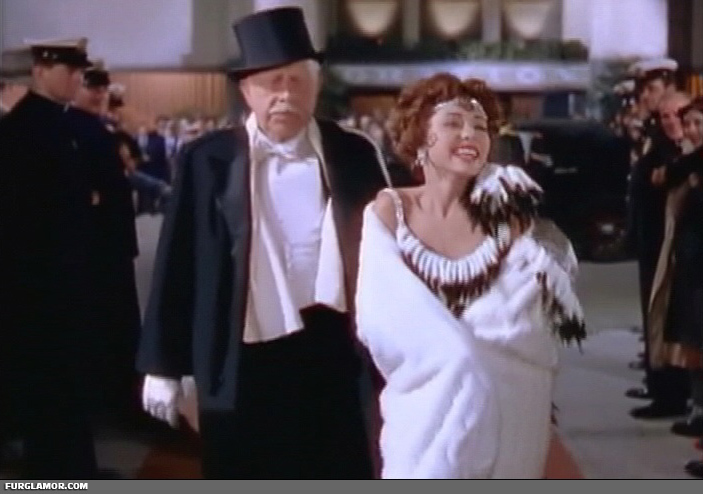 The film starts with the premier of Don and Lina’s latest film, The Royal Rascal, with a staple of film-making from the period: the red carpet arrival sequence. There’s a couple vaguely interesting pieces on display here. Enter Lina in this coat with a very large white fox collar. Lina spends most of the opening silent, the reason for which becomes obvious towards the end. 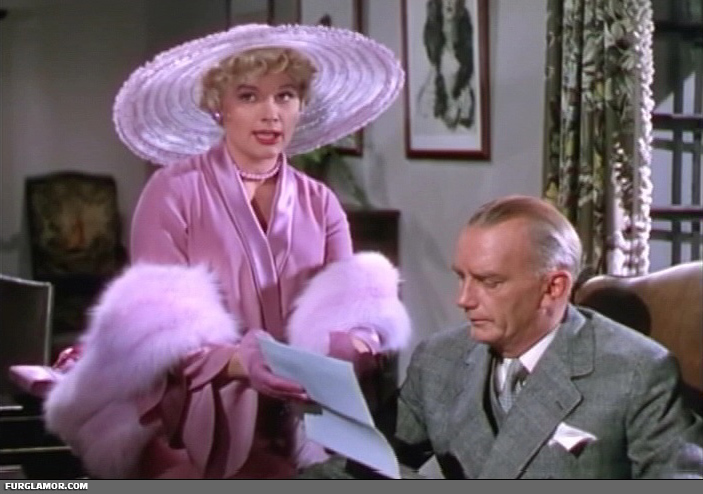 Close up of the collar, the white fox very nicely frames Jean Hagen’s ultra-blonde locks. 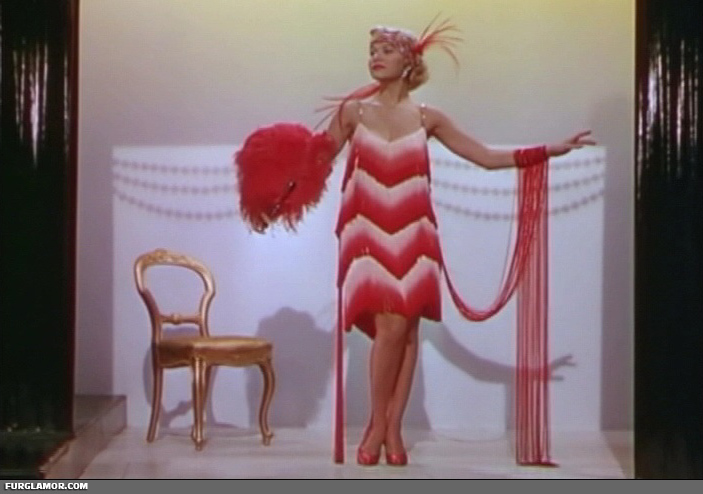 The entire outfit is a 50’s musical version of the classic flapper look. 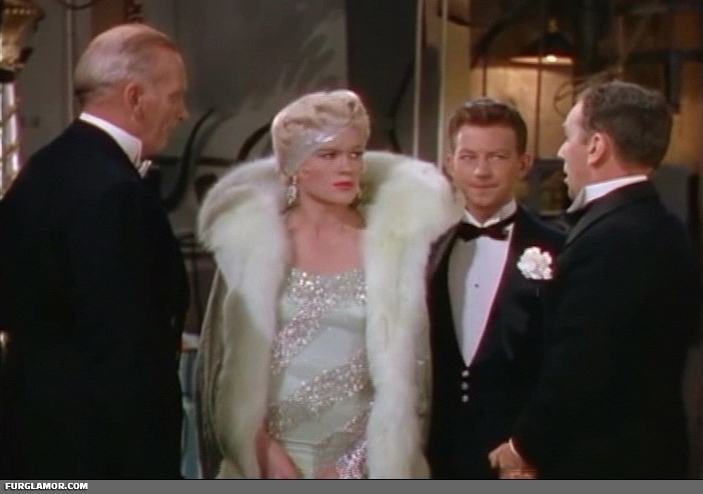 It gets points for the inclusion of white fox, and quickly loses them for the want of a very long cigarette holder. BINGO. 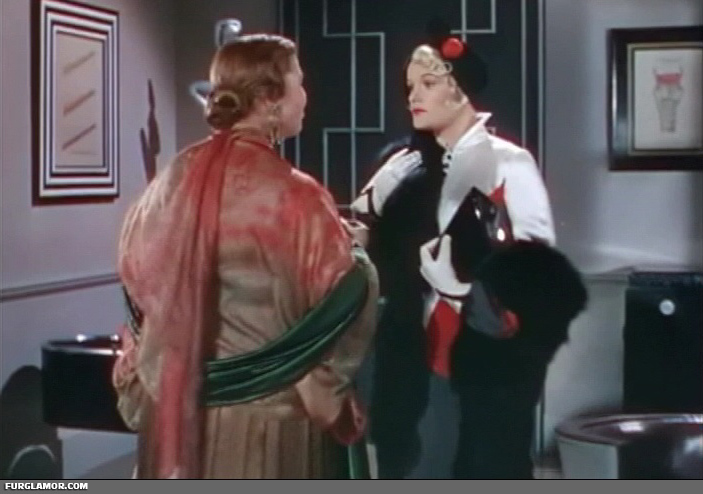 Yes, the best thing in the film, visible for but a few brief seconds as the lines “If you must wear fox to the opera, dame fashion says: Dye it!” Could agree more, my friend, couldn’t agree more. Lina wears this black fox stole while attempting to get vocal coaching. Like our next entry, it’s the kind that has a few too many extra bits for my liking. 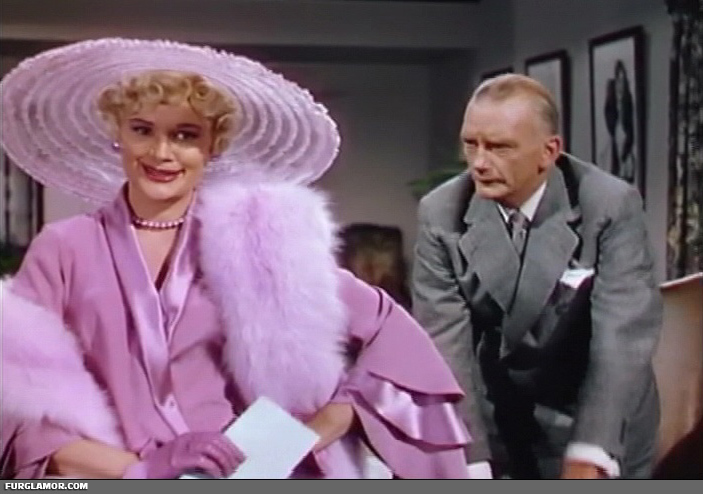 Lina heeds the films advice, though she chooses a slightly less saturated pink for her final fur of the film. She wears this pink fox fur stole whilst in contact negotiations/blackmail with the studio boss. Closer angle, providing a good shot not only of the fur, but Lina’s highly color coordinated pink gloves. So, we’ve got some variety and a couple decent foxes as anchors. 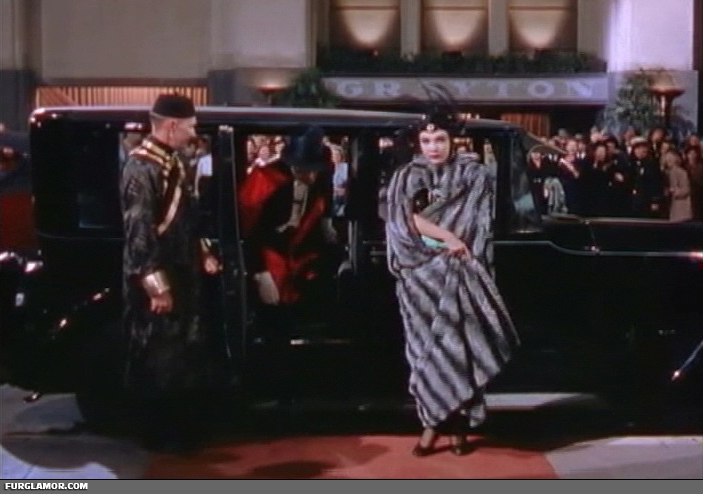 While I would have preferred the pink fox wrap from the fashion sequence have been all fox (same for the white fox in the opener), at least it got the color right. If there’s no danger of inducing blindness, then there’s not enough dye for me. The ratio is 8%, because Lina spends a good few minutes in both the white fox and the pink fox. 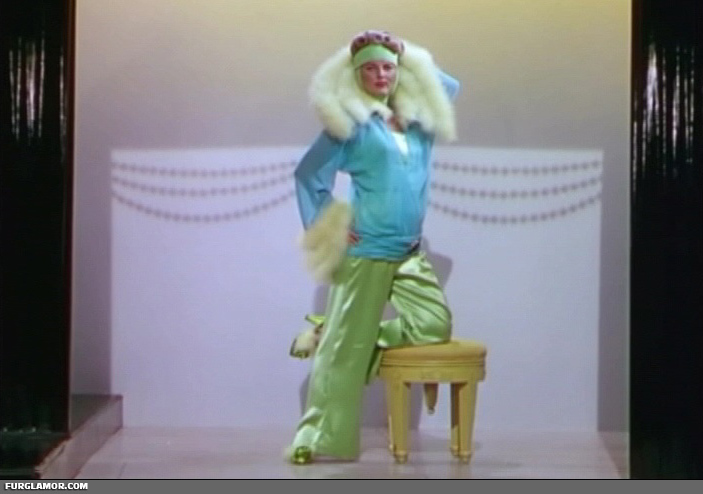 Full Gallery: Fur Fashions of the 1952 film Singing in the Rain. Warning, editorial content: Seriously, WTF? Nothing to do with Singing…, but two threads at FFG deal with screencaps. This one has ‘caps from more recent film & TV shows. Heh, for anyone of a more delicate constitution you should be aware there’s a bit of an adult flavor to the website that SimonG has linked, so enter at your own risk. Of course you’ll have to register to enter at all, I should also point out.